Tammie Lee, I'm loving your artwork! :) I feel like this painting is ME. I cannot feel good without my rituals and routines. I'm a nature loving spirit and I send out my energies every morning. I feel blessed to live in nature. Love the painting!!! Thank you for enjoying my art! So fun that you relate to this painting and message. I will be putting it in the shop if you are inclined to own it. I also feel nature is a blessing. Such pretty colours in this one, and a beautiful sentiment. Thank you for enjoying colors and sentiment. A yellow dress is new for me. The floor is something i was daydreaming about, wondering what it would be like to live with. Differently the picture has become, but that is just as beautiful what I see! Is a wonderful idea that needs the world! Thank you Elke. I think the world could use this too. dear Tammie,I enjoy and I join these comments! Grandioso! Your message is important for this world, longing for love, joy and goodness. Greetings from my hermitage to yours! hello dear Dori. Thank you! Have missed some great art posts Loved them all, especially the girl friends. I didn`t think I had rituals or routines but my family laughed and said I had lots. It is great when art has a mind of its own and just has to be heard. What a perfect routine and lovely watercolor! I have the same habit - when I move something, I often forget I move them. 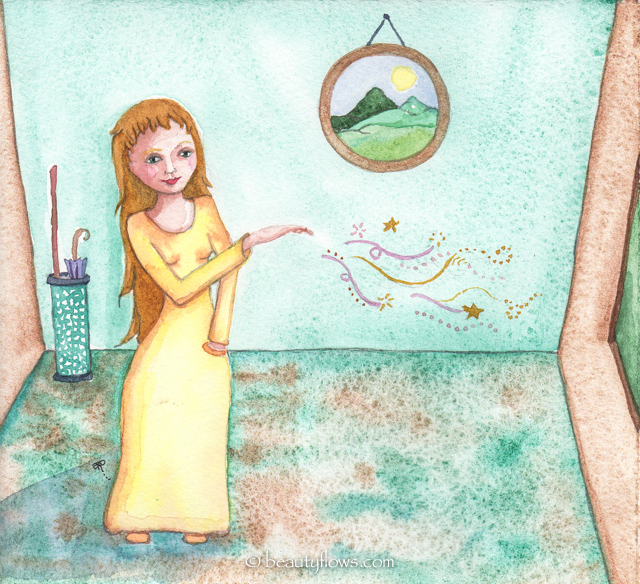 I love this painting of the lovely girl casting her magic spell! It seems that happens alot to me, too - the piece I'm working on seems to have a mind of its own... Like you said, that's when the fun begins! The muse had its way with you, Tammie. How lovely for you and for us. Your girl's posture and smile make me think she's enjoying her life as much as your muse! Oh, Tammie, the ModernCreativeLife.com theme for the next two months is routine and ritual. I hope you will submit something for it. I don't know if it has to be new or never on your blog (or in the same form) though you can link to it from your blog when published. Check the submission guidelines on the site -- this would be perfection! Love the fairy... or wise woman? Isn't that amazing how the painting led the way, such a beautiful painting with a lovely message must have wanted to go out into the world. I know what you mean about the waste-paper basket, but it is supposed to be good for our brains to move things about to keep us on our toes mentally (or annoy us intensely that The Thing is in the wrong place). So smart Tammy. I love the waste basket and how this painting took a beautiful turn!! The words are beautiful with each painting!